At least six migrants have died and up to 100 more are missing and feared dead after their rubber boat sank in the Mediterrranean on Thursday. The president of the Italian unit of Doctoers Without Borders says a British navy ship rescued 27 people and recovered six bodies around 35 kilometres from the Libyan coast. The latest tragedy adds to the death toll which aid workers have put at at least 240 for the three days ending on Wednesday. 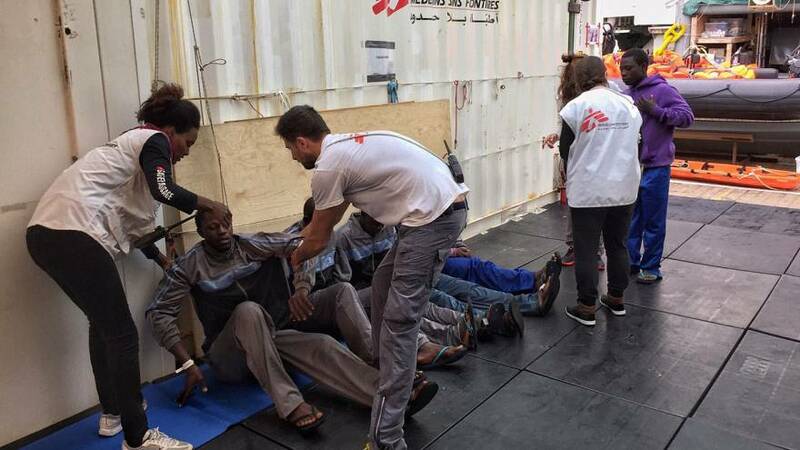 The migrants were transferred to the MSF ship, the Bourbon Argus. Survivors have told staff another 90 to 100 people had been on board and are missing. “It is plausible because these boats are all the same, very long rubber boats that usually carry 120-130 people, completely packed” said MSF Italy President Loris de Filippi. “The conditions are terrible and people keep putting out to sea anyway, which says a lot about how desperate they are,” de Filippi added. Hundreds more migrants have disembarked in the Sicilian port of Catania. They huddled on the deck of their rescue vessel, wrapped in thick blankets and soaked by heavy rain. Rescuers recovered one body and saved 298 people in the Mediterranean on Tuesday. A rubber boat carrying an unknown number of people flipped over in heavy seas, according to Italy’s coastguard. The survivors were rescued from a total of three rubber vessels, according to the Italian coastguard. An oil tanker pulled 15 people from the water around 55 kilometres off the Libyan coast. Officials will not estimate the number of missing. Rescuers say five dead bodies were recovered from one of the rubber dinghies. The crew say they saw another person drown but were unable to recover the body. Challenging, according to a spokeswoman from SOS Mediterranean. It has surged this year to 4,271 as of November the 14th. This is compared to 3,777 for the whole of 2015, according to the International Organisation for Migration. Arrivals in Italy this year now stand at around 167,000. Last year’s total was 154,000.